I have used video cameras 4 different ways at the 3 eclipses I have been to. 1. I used a video camera on a regular camera tripod doing a technique I call the "drift method" (2001). 2. I used a video camera mounted on a clock drive tracking the eclipse (2002). 3. I used a video camera on a cruise ship having to continually re-point the camera (2006). 4. I use a second video camera on the cruise to document the change in lighting during the eclipse (2006). Focal length is important for video cameras in exactly the same way as it is for regular camera photography. You have to understand the power of the maximum optical zoom on your video camera and what Sun disk image scale it will provide. You probably should not use and digital zoom features that your video camera may have. If your optical zoom is not powerful enough, you should consider a good quality 2x teleconverter. 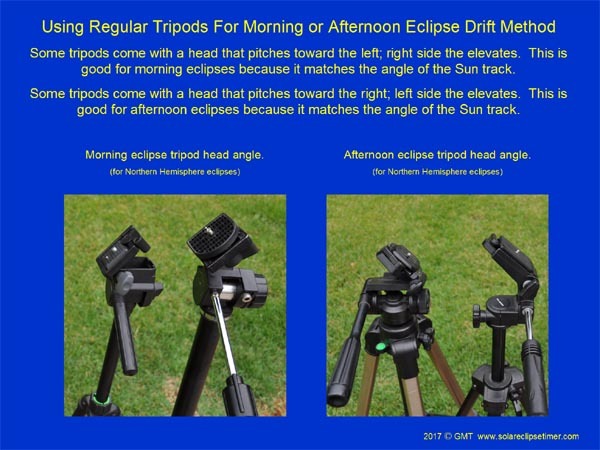 With a clock drive, where you track the eclipse with your video camera, you can increase the focal length up to the point of keeping about 2 Sun diameters of "padding" around the full Sun disk size with a solar filter. This might require buying a high quality 2x teleconverter for your video camera. You should use a video camera that has the ability to turn off auto exposure and use manual exposure. As with focusing, you just can't tell if your camera may be sophisticated enough to know how to adjust the exposure when you remove the solar filter, going from the slim filtered crescent to full totality. Do you want to risk ruining your video? It is much safer to have the ability to manually adjust the exposure. I have found that the manual setting you use for the crescent phase exposure, through a filter, in the last few minutes will be fine when you remove your solar filter to catch the diamond ring and Baley's beads. Later in totality, you may have to make one slight adjustment where you increase the exposure just a little to expand the capture of the corona. This is a great way to video an eclipse. It is easy to setup and basically on auto-pilot during the eclipse so you don't have to worry about it during totality. With today's high definition cameras, you will get great detail! If you are a first-time eclipse observer that does not want to set up a long focal length camera rig, after the eclipse is over you can pick frame shots of the diamond ring and Baley,s beads off of your video. This technique requires some testing sessions with you video camera now, with a solar filter on it, on a clear day with the Sun high in the sky. Set up your video camera on manual exposure, manual focus and zoomed to the maximum optical zoom. Line up your video camera by having the Sun on the left-hand side of the LCD screen. Start the Sun there, allow the Sun to "drift" across the LCD screen and time how long it takes to get to the right-hand side of the LCD screen. Now, if your camera does not have a very powerful optical zoom, this test might take the 10 or 15 minutes to cross your LCD screen. If that is the case, then your Sun disk image is too small and you need to buy a good quality 2x teleconverter for your video camera. What you want to get to, is a Sun disk image that is a size, that will cross your entire LCD screen in about 7 minutes. Combining this with the awareness that you still have to maintain 2 Sun disk image widths above and below your Sun disk image. Just before totally, at about 3 minutes before, you line up you camera with the Sun on the left hand side and start recording at 2 minutes before totality. At about 15 to 20 seconds before totality, you pop off your solar filter and just let it record. Totality length will be 2m and 40s at its longest duration. After totality put your solar filter back on and the Sun will stay in the field of view for another 2 minutes. The only thing you may have to do is a minor increase in the exposure at some point during totality You will end up with a beautiful 7-minute video of the event with the audio of the crowd reaction around totality! And this technique takes very little effort! There is one other thing that you have to be aware of, test for, and use another trick to make this work well for you. You have to take the path of the Sun into consideration and this depends on where in the country you will be viewing the eclipse. 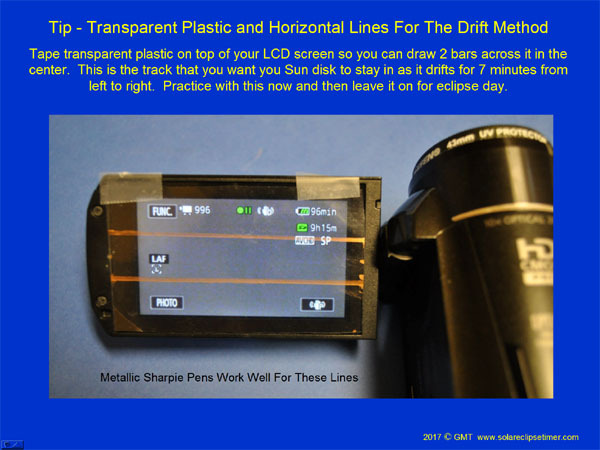 Let me explain: when doing the drift method you want the Sun to drift across the screen center on the horizontal axis of the screen. Because Greatest Eclipse is in Kentucky, for the center 50% of the country, the path of the Sun across your LCD screen will basically be horizontal. Meaning, you will not have to pitch the head (platform) of your camera tripod. But on the two coasts the Sun track will have some angle to it, so in Oregon, Idaho, Wyoming, Nebraska you have to pitch your video camera with the right side of the LCD screen up for the morning Sun angle. By eastern Nebraska, the period of totality has become close to horizontal in the sky for the purposes of the drift method. 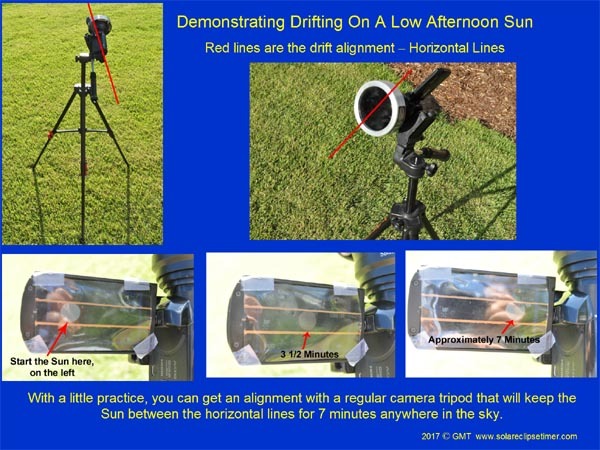 Then once you get to eastern Tennessee, Georgia, North Carolina and South Carolina the Sun track has an angle to it again and here you will have to pitch your video camera with the right side of the LCD screen down to match the afternoon Sun angle. So, the trick is to cut a piece of clear transparency plastic and tape it onto your LCD screen. Then use one of the metallic Sharpie pens to mark a band across the horizontal center of LCD screen, at the width of the Sun disk image size (top and bottom) for your setup. This is the axis of the path that you want to adjust for depending on where in the path you are observing. 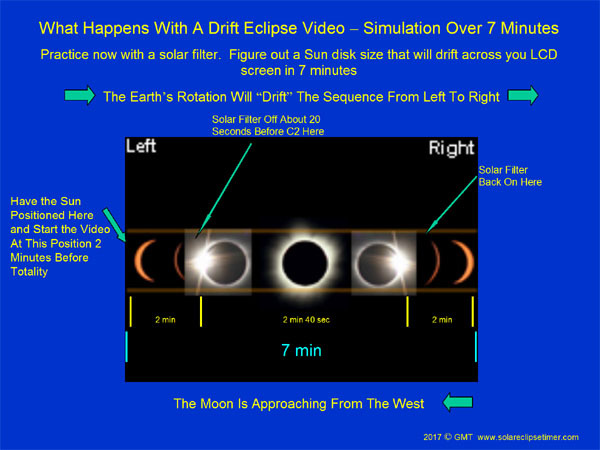 You can use the Eclipse Mega Movie Simulator to get a feeling for the Sun track angle on eclipse day. The other beauty of this technique is you can take little 7-minute videos of the partial phase progressions Take a 7-minute video starting at 2 minutes before 1st contact and you will capture the first "bites" that the Moon takes out of the Sun. Take a couple of additional segments between C1 and C2. This also helps you line up the horizontal bars to keep the Sun "drifting" in between them just before you get close to totality. Drift through totality as described above. Then take a couple of segments between C3 and C4 making sure to get C4 when the Moon finally moves completely off the Sun. After the eclipse you can edit them together for a movie of the entire eclipse and the edits will be relatively smooth if you always line up the Sun in your pre-marked horizontal band. If your intention is to get the biggest image that you can of the corona, then decrease your drift time to about 4 minutes. Then you would basically record; 30s before totality - totality - 30s after totality. This is dangerous because you are going to be VERY excited in the last minute before totality, you might forget to deal with your video camera! That is why a recommend dealing with your video, with the drift method, starting 2 minutes before totality when things are still calmer and you are thinking clearly. This is obviously easy. 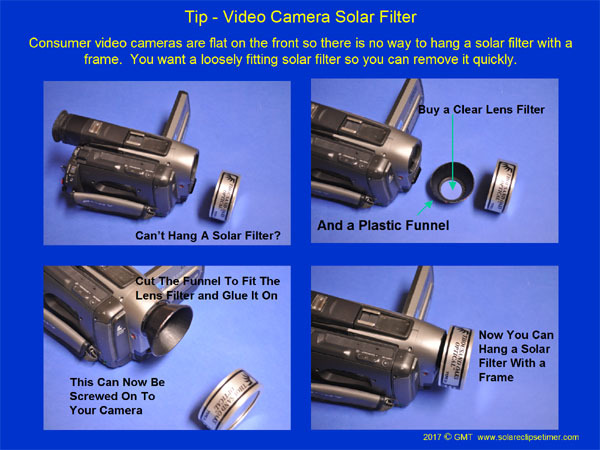 You will have your video camera mounted to your setup and it will track the eclipse. Most people will have the video camera piggybacked on the telescope. 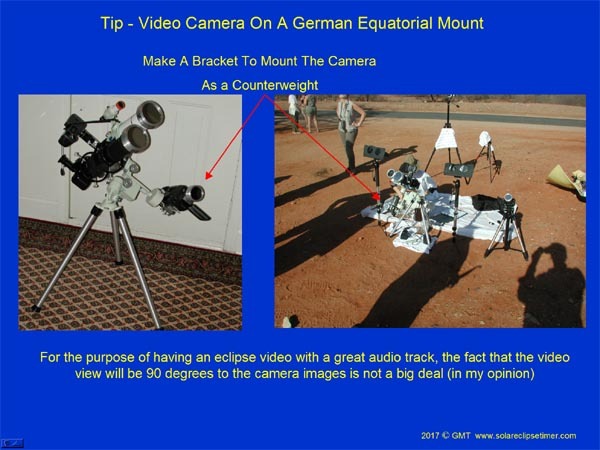 One trick I used in 2002 was to have the video camera also work as a counterweight on my German equatorial mount. I made a custom camera mount for the purpose. When you are traveling overseas to an eclipse the amount of gear you take and the weight of the gear you take is a consideration. So using the video camera as a counterweight was helpful. Back then it was a relatively heavy Hi8 regular definition videotape camera. 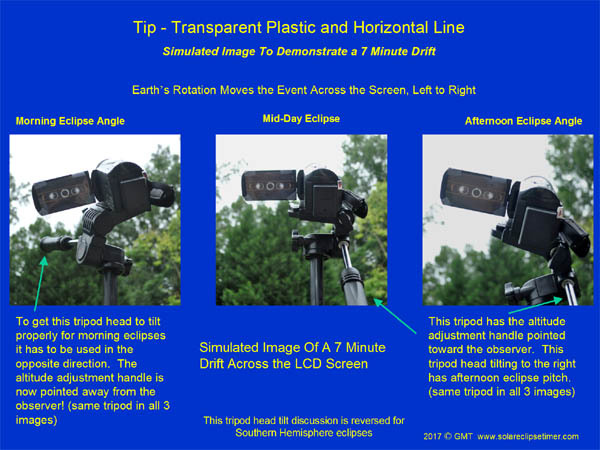 For the purposes of amateur video of totality, it really does not make any difference that the video is 90 degrees to the axis of the cameras. The video to totality is beautiful and exciting and when you show your video to your friends and family or post it on the internet, I guarantee you that 99.9% of the people who view it will not know that it is rotated 90 degrees. There are some eclipse photography purists that want their images of the Sun to have the true North of the Sun at the top of their image, that's fine, but that's not an issue with what we are trying to achieve here. I had to do this in 2006 because I was on a moving cruise ship. I see no reason to struggle with this for a land eclipse. Use the drift method or use a clock drive. So this year I have a plan to record the change to darkness with two video cameras. On one camera I will use manual mode as I did in 2006, but I will start out the exposure slightly over exposed, trying to guess and be lucky that the exposure will capture images during totality. On the second camera, I will use a wide angle action-cam that only uses automatic exposure and see how that captures the change in lighting. I have not figured this out completely yet and plan to do some testing at sunset for this. You need to test you camera tripod now. First for altitude at the time of totality. At the coast of Oregon, the altitude of the Sun will be 39 degrees and most camera tripods will get to this attitude fine. By the middle of Idaho, the Sun altitude is already 48 degrees. By the eastern side of Nebraska, the Sun has already reached an altitude of 60 degrees and you have to make sure your camera tripod can get to 60 degrees without obstruction by the control arms. From eastern Nebraska all the way to the coast of South Carolina the Sun altitude stays above 60 degrees, peaking at Greatest Eclipse at 63.9 degrees. Second, you need to test the horizontal/vertical adjustment now. With the altitude adjustment knob facing towards me, 3 of the 5 camera tripods I own tilt the tripod head to the right (lifting the left side of the camera upward). Two of the 3 tripod heads tilt the tripod head to the left (lifting the right side of the camera upward. For the drift method to work nicely you have to line up your horizontal marks with the track of the Sun. On the West coast, you need the right side of your camera higher. On the East coast, you need the right side of your camera lower. Now, you don't have to shop for a tripod that has a tilting head that matches the coast you are going to observe from. You just have to turn your tripod head 180 degrees and have the altitude adjustment control pointing away from you. Sorry if I am making this statement and that it is obvious to some of your, it may not have been obvious to others. I hope these tips help you and give you some ideas for your own setup. Featured In Sky and Telescope Magazine, 2002, 2003 and 2017! Solar Eclipse Timer and the Solar Eclipse Timer logos are Resistered Trademarks of Gordon Telepun. The Solar Eclipse Timer banner art and all other art related to the Solar Eclipse Timer website and mobile applications are protected by copyright.